Hello again and welcome back to my blog. 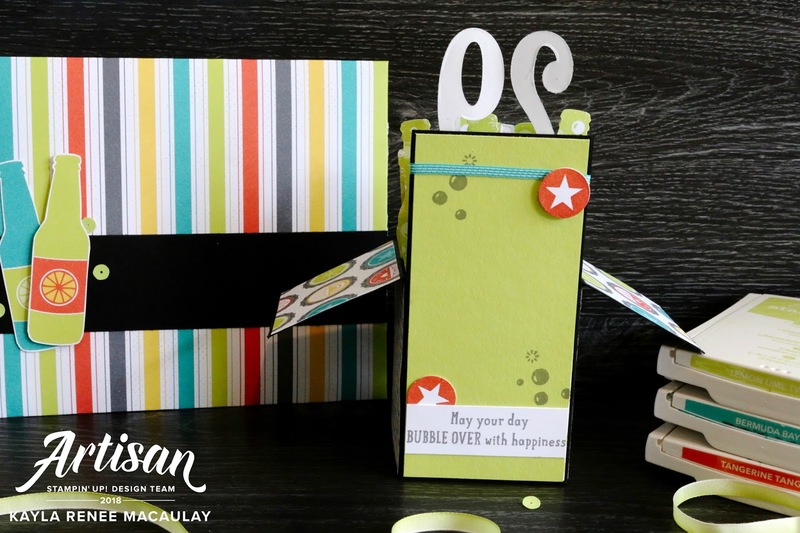 I had a BIG crafty day today with my good friend Jodie and we got creating with the Bubble Over bundle and Bubble & Fizz Designer Series Paper that you can earn for FREE at the moment with a $90 order. This paper is awesome and I am absolutely addicted to using it! It has such a gorgeous combination of colours like; Lemon Lime Twist, Tangerine Tango, Daffodil Delight, Bermuda Bay and Basic Gray. It's a great combination of colours and absolutely fantastic for masculine or teen cards! Today I was really inspired by the lovely Julie Kettlewell from the United Kingdom to create this Bubble Over Card in a Box for my cousin who is turning 29 today. Here's a look at the completed card. 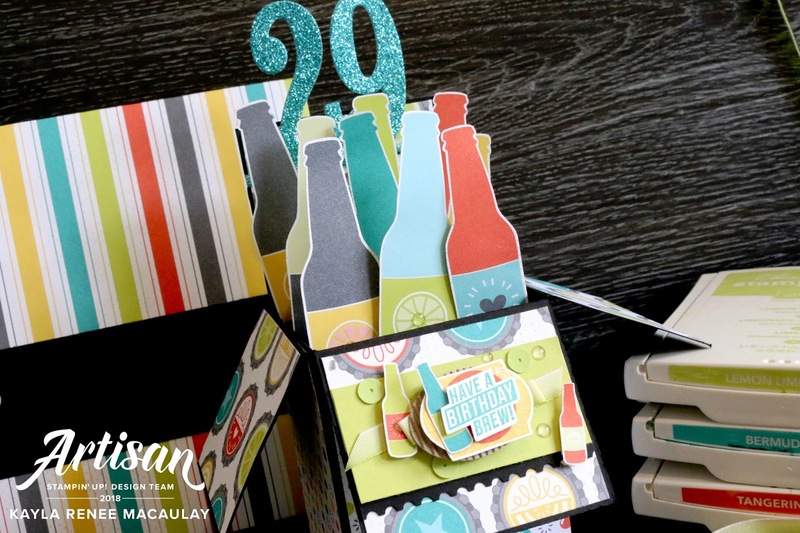 I used the Designer Series Paper to cut out the beer bottles and tiny bottles for accents. 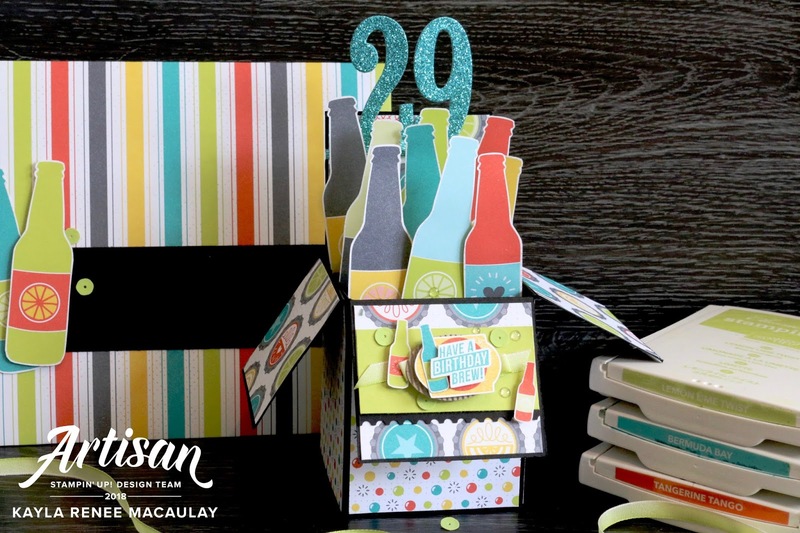 It was a really fun card to make and I combined it with some great Lemon Lime Twist Ombre Ribbon and Corrugated Elements from the Annual catalogue. I also used the Ticket Tear Border punch to add some added interest to the front panel of the box card. I added some extra embellishments with the Glitter & Clear Epoxy shapes which really represent 'beer bubbles' which is pretty cool & I added some Lemon Lime Twist sequins from the Tutti Frutti collection. For the '29' I used the Large Numbers Framelits with some of the gorgeous Glimmer Paper from the Myths & Magic suite. I love how you can personalise an age for a birthday card with these great framelits. For the back panel of the card I added a layer of Lemon Lime Twist, an additional sentiment 'May your Day Bubble Over with Happiness' and added some bubbles with some Basic Grey and a couple of Tangerine Tango accents using the Bubble Over stamp set. I also added some Bermuda Bay ribbon. To finish off my card gift I created a personalised envelope with the Envelope Punch board with some of the Bubble & Fizz Designer Series Paper and cut a couple of beer bottles from the paper also. I added a strip of Basic Black and some sequins from the Tutti Frutti collection to finish it off. I hope you liked my card today and it gave you some inspiration to use this great collection of products which you can find linked at the bottom of my post. I hope my cousin likes it too!